Soften refrigerated pie crust as directed on package, then roll out to a 12-inch diameter. Place on a lightly greased parchment paper-lined baking sheet or on a silicone mat; set aside. Remove pits from plums and slice very thin. Toss with almonds, raisins, lemon juice, flour and 1/4 cup sugar. Taste; if tart, add remaining sugar. If sweet, don't add any more sugar. Pour plum filling into the middle of the pie crust, leaving a 2-inch border around all sides. Fold border up and over the filling, leaving a hole in the center. You can fold the crust edges over themselves to make edges pretty. Place galette in oven and bake 30-40 minutes or until crust is golden brown and juices are bubbling (they might pour out of the sides; this is normal). Remove galette from oven and allow to cool on baking pan 20 minutes, then carefully transfer to a cooling rack to cool completely. I’m a big fan of galettes. They’re an easier-to-make, more rustic cousin to pie (though I love me some pie, too). Instead of guessing what kind of filling is hiding inside, galettes keep everything exposed so you can see and smell the delicious flavors packed inside the crust. Savory or sweet, I could eat a galette any day (well, in moderation, of course). One of my favorite sweet galettes is this Plum Almond Galette. 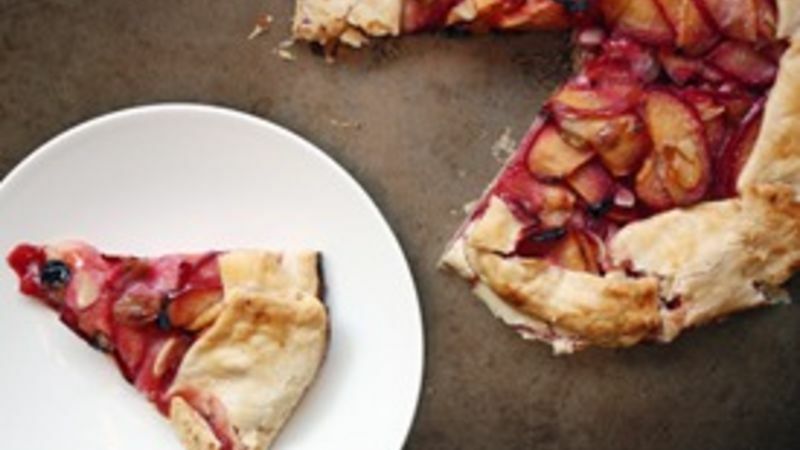 It’s equally tart and sweet, with the texture of crunchy almonds combined with soft baked plums. It’s the perfect accompaniment to a flaky, buttery crust. And the best part? You can make it, bake it and eat it in less than an hour. This is definitely one of those recipes where “to taste” is key. If you like a more tart flavor, leave out some of the sugar and add an extra squeeze of lemon juice. If you’ve got an indelible sweet tooth, add all of the sugar. You can also add your own combination of fruits or extra spices, like cinnamon or nutmeg, or keep it simple with the almonds and golden raisins. I like to serve this galette slightly warm with a dollop of vanilla bean ice cream or homemade whipped cream on top, but it’s just as delicious on its own for an indulgent breakfast, a snack or dessert. So the next time you’ve got pie on the brain – but not a lot of patience – make this galette instead. It not only saves effort and time, but it keeps your sweet tooth happy.